Give a child, any age, a piece of paper and a pencil or crayon. Ask them to draw a scientist. Chances are very likely that what returns on that paper is a rendering of a white male in a lab coat, wearing glasses. 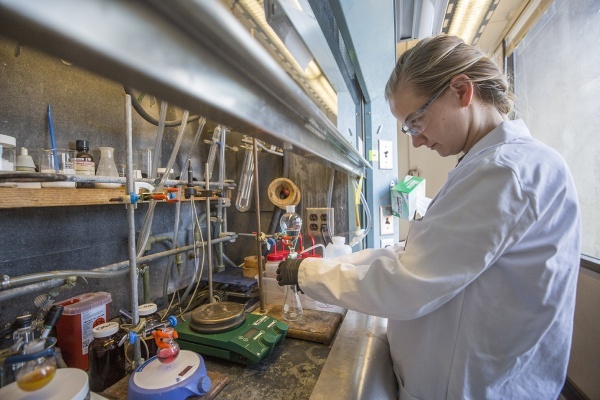 Lisa Eytel, a graduate student in organic chemistry, has conducted that experiment over and over as the outreach coordinator of Women in Graduate Science (WGS) at UO. Countless times, she's seen the same results. The stereotype has persisted for generations, decades, as far back as history cares to go. It’s not just an image, but a message. A scientist is a man. A Caucasian man with glasses. “Sometimes, he might be wearing Birkenstocks, but it’s still a guy,” Eytel laughs, sitting at a table in the science library café, where the walls reflect written equations and formulas in a bright, attention-grabbing yellow. “Even we catch ourselves—I was at a conference and we were talking about scientists and kept using the male pronoun, ‘he.’ ‘He did this,’ and ‘he did that.’ Why does it have to be a he? This is not surprising to the two women with Eytel at the table. On Eytel’s right is Andrea Steiger, also a chemistry grad student and the president of WGS, and across the table is Michelle Massaquoi, a biology grad student, and the social coordinator for the organization. WGS (above) wants to change that. The 150 members of WGS at Oregon form one of the largest graduate student women’s groups in the country. The success of WGS is so uncommon, other university student groups nationwide are seeking directions about how to start and maintain a student women’s science organization of their own. "Get over wanting to be 'liked'"
When Richmond was in graduate school at the University of California, Berkeley, in 1976, women in the sciences were on their own. Nothing like WGS existed. Richmond, a former president of the American Association for the Advancement of Science and the recipient of a National Medal of Science, cofounded the Committee on the Advancement of Women Chemists in 1998. This grassroots organization encourages women to pursue science careers and supports women scientists across the US and in developing countries. Richmond’s advice for grad students like Eytel, Steiger, and Massaquoi is straightforward. On the first morning of their chemistry recruitment trip to UO five years ago, Eytel and Steiger (below) were sitting together at breakfast when female graduate students appeared, handing out WGS pens and granola bars with business cards taped to them. They were the only group on campus that came to welcome prospective students, especially women. On a trip to another school, Eytel recognized a clear lack of female grad students in the organic chemistry department, her field of study. UO became her top choice, and as she defended her undergraduate thesis at Russell Sage College in New York, she kept that WGS pen for the duration. “It was like my security blanket,” she says, laughing. Steiger, whose first childhood foray into the sciences involved mixing body lotion into her sister’s shampoo bottle to see the results, kept in contact with those WGS members. They advised her about academic conferences and finding a place to live in Eugene. The WGS approach impressed her so much that, now as president, she and other WGS members did the same thing at this year’s recruitment breakfast. Granola bars and pens are strategic offerings. In 2005, WGS was established by graduate student Sarah Staggs Wisser, who worked in the lab of Darren Johnson, a professor of chemistry and NSF CAREER Award recipient. He was writing a National Science Foundation grant proposal and included funding for the group, and has been the faculty advisor since that time. Johnson says WGS has exceeded every expectation he had when he wrote the proposal, noting that the group has attracted the support of donors directly, and had one of their board members invited to serve on a UO president-level committee on strategic planning. WGS has three main facets: outreach, professional development, and a social component. Combined, they serve to create a support network for women in the sciences and to institute a curriculum and awareness for future women in science. WGS wants to correct that. They coordinate field trips for elementary school classrooms, produce science slams in the spring, and work with local organizations like Ophelia's Place in afterschool programs for older female students. With their extensive outreach efforts, WGS offers Science Adventure Days—a six-week program on Saturday mornings that covers the gamut from forensics to geology to astronomy—for girls at the exact age when they start to abandon science. Female graduate students staff the program. 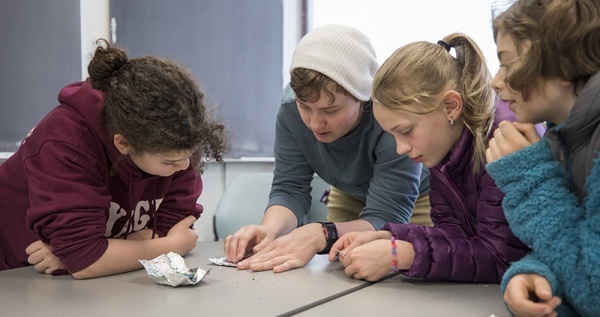 During a recent forensics class, eight fourth- to sixth-graders entered a classroom in Klamath Hall to discover that someone had “stolen” their cookies. They lifted fingerprints, learned about whorls and signatures in the prints, ran experiments on the ink in the ransom note, and by noon, had correctly identified which of the adults standing by was the culprit. On another Saturday, the subject was geology, and the young girl scientists used crayons to represent rocks and explore ideas such as compression. They laughed and shrieked as they jumped on heavy books to increase the pressure on their crayon “rocks,” replicating how sedimentary rocks are formed. Professional development is also key for WGS, through seminars and workshops on résume building, identifying personal and professional strengths, and networking. WGS also covers nonconventional approaches, such as how to explain your science in a one-minute elevator pitch or use art to demonstrate what an application of inorganic cluster compounds looks like. WGS also sponsors a mentorship program with undergrad students, offers scholarships, and funds travel awards to conferences—regardless of gender. These efforts cost money; fundraising is always on the minds of WGS leaders. They are fortunate to have private donors and grant funding, but grants sometimes aren’t renewed. “We are always looking for more ways to join with faculty in mutually beneficial partnerships,” Steiger says. The WGS annual fundraising banquet is one of the group’s main sources of income. This year, the keynote speaker was astronaut Wendy Lawrence (left), a veteran of four space missions, including trips to the International Space Station. Lawrence, in a measure of solidarity, waived her speaker’s fee. 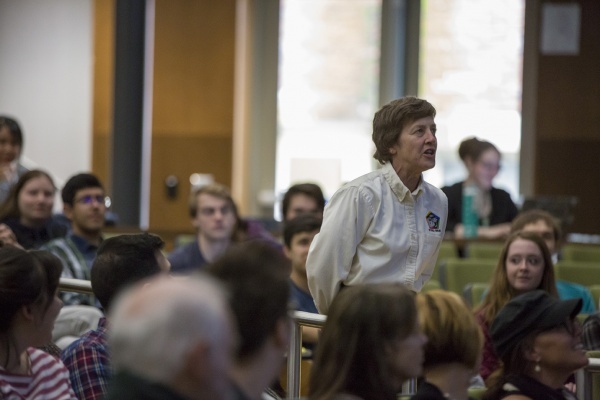 The day prior to the banquet, she arrived on the UO campus to deliver a lecture about working for NASA, and afterwards, led a more intimate Q&A session with WGS. Collected around Lawrence in a half-circle, the members asked her what it was like during take-off, what Earth looks like from that far away, if dreams are different in space, and how the sciences can become more appealing to women. Steiger couldn’t agree more. She sees a positive future not just for WGS or female science students at UO, but across academia and industry. Within 10 years, she hopes the organization will have expanded to have equal involvement from all UO science departments and the number of women faculty, undergraduates and graduate students in UO sciences will reach 50 percent.